Danielle from Mom Inspired Life is here with us today in our ABCs and 123s series with a great idea for an Alphabet bead water sensory bin. It’s a super quick an easy set up and, as you will see, works great for children of different ages. 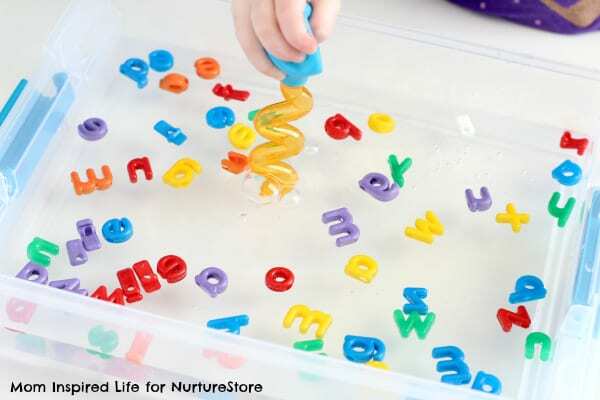 This alphabet bead water sensory bin is a fun, hands-on way to explore letters and learn to identify them by name. It is super simple to set up and something that can be done again and again. My kids loved it. One of my favorite things to do is create playful and engaging alphabet activities for my kids and sensory experiences are always a hit with them. I like that they give them a chance to simply play, investigate and build skills on their own with little to no input from me. 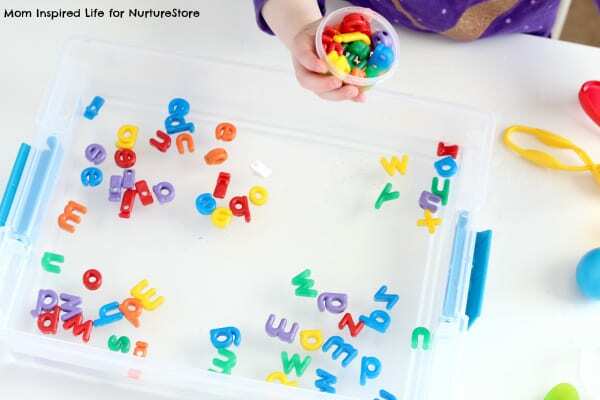 This alphabet sensory bin is an excellent way to allow young children a chance to use their senses to explore letters. The water aspect adds to the sensory experience and really increases their engagement with the activity. Don’t forget to add in some tools for fine motor practice. Fill the bin about half full with water. Add the alphabet beads to the water. Lay the fine motor tools next to the bin. I put the bin and tools on the table and waited for my kids to discover it. They quickly did and were super excited to dig and start playing! My two-year old grabbed the spoon and began stirring and scooping letters. As she was doing this she would say letter names she knew. They weren’t exactly the correct name for each letter, but it was great to see that she recognized that these were letters and that she remembered some of the letter names. While she played in the bin and practiced using all of the different fine motor tools, we would talk about the letter names. I would say things like, “Oh, wow! You scooped up the letter “b.” She would often mimic the letter names after I said them. This is a great way to introduce letter names and even letter sounds to young children. It is low-pressure and simply occurs as a natural by-product of play with the letters. My four-year old knows the letter names and letter sounds, so while he was playing he would name the letters and/or sounds. This was great modeling for my toddler. He also would say things like “This is a ‘d’ for dog.” This is great for me to hear because it confirms that he is able to identify beginning letter sounds in words. He even used some of the alphabet beads to spell sight words he has recently been learning. 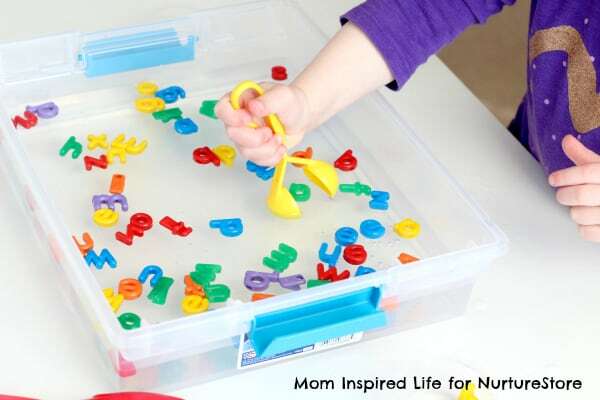 Overall, my kids thoroughly enjoyed this alphabet bead water sensory bin. They played for a long time and even asked if they could do it again another day. Sounds like a great plan to me! 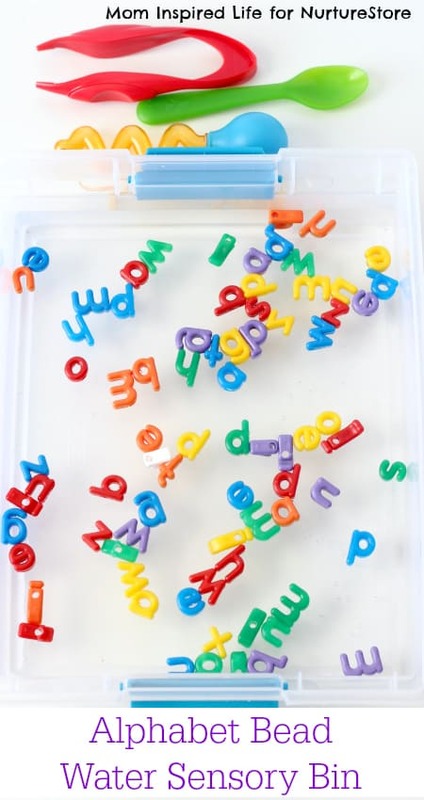 For even more alphabet sensory play, check out this Sugar Cookie Sensory Tray. 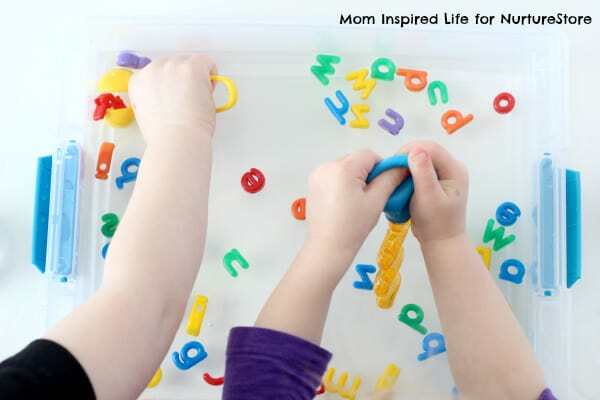 Danielle is a former elementary teacher, a mom of two and now shares playful learning activities at Mom Inspired Life. Make sure you subscribe to her newsletter to receive activities straight to your inbox! Do you have a young child who is learning their ABCs and 123s, and do you want to make their learning fun? Our ABCs and 123s resource of mulitsensory, play-based letter and math activities is just what you need. See more here.